I almost don't want to tell you guys this, but I feel it's my duty. THERE IS NO PUMPKIN ANYWHERE!!!!!!! I always go into a cooking and baking frenzy in the fall, and pumpkin muffins are on the list for this week. You may or may not know that I am a bit obsessed with pumpkin. Pumpkin muffins, pumpkin spice lattes, and candy corn pumpkins are a big part of how I accept the end of summer. The kid and I went to Stop and Shop yesterday morning to stock up on groceries, and the pumpkin wasn't in aisle 7 like it was supposed to be. I stopped an employee. "Excuse me, there's no pumpkin in aisle 7, is it somewhere else?" "Oh we haven't had pumpkin in forever," she said. "It got recalled last year. If we have it at all, it would be in the natural foods aisle." I tried to hold in my panic as I gathered yogurt and Drano on the way to the organic aisle... IN WHICH THERE WAS NO CANNED PUMPKIN. I came home and googled "libby's pumpkin recalled," and on a Cooking Light thread, a commenter said, "You can get more Libby's canned pumpkin than you'll ever need on Amazon." 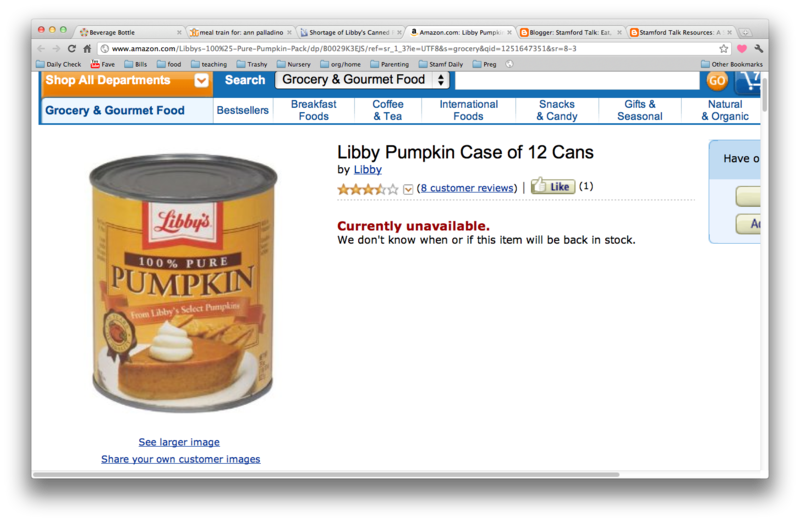 I eagerly clicked on the link provided and saw an image of a can of Libby's pumpkin with the horrifying statement, "Currently unavailable. We don't know when or if this item will be back in stock." This situation is serious, people. I'm stopping by Mrs. Green's later today to see if they have canned pumpkin. If not? Well, I guess I'm going to have to take the unimaginable step of BAKING A PUMPKIN and like, pureeing it myself. What a pain. Trader Joe's doesn't have canned pumpkin yet (or didn't when I was there last week), but that was my go-to pumpkin source last year. I'm pretty sure I saw One Pie canned pumpkin on the shelves at Palmer's in Darien last week, but I'll double check the next time I'm there. Just you wait... the 24 hours news outlets will have this as a terrorist plot to disrupt Thanksgiving if this goes on much longer. Pumpkin season is soon upon us, though, and once the processors have the new crop of pumpkins, we'll have more cans appearing on shelves. Better that than a trip to the ER for pumpkin-related food poisoning, right?? ?